Both cataracts and glaucoma can be a natural part of the aging process. Many people over 60 may have both. Otherwise, the two are not associated. Glaucoma is a group of eye diseases that gradually steals sight without warning and often without symptoms. Vision loss is caused by damage to the optic nerve. A cataract is an eye condition where cloudiness, or opacity in the lens, blocks or changes the entry of light, affecting vision. Cataracts and glaucoma are both serious conditions that can cause loss of vision. However, loss of vision due to cataracts can be reversed with surgery. Loss of vision from glaucoma is, as yet, irreversible. Those with glaucoma are usually not at higher risk to develop cataracts. There are exceptions, including those who have glaucoma due to secondary causes such as eye inflammation, eye trauma, or steroids. 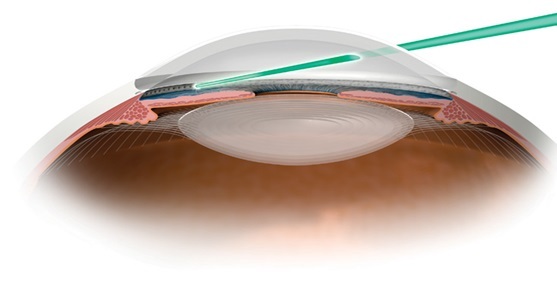 Unlike vision loss from glaucoma, cataract vision loss can often be regained. In most cases of cataract surgery, the cloudy lens of the eyes is removed and replaced with a clear plastic lens (called an intraocular lens implant). For patients with mild glaucoma that is stable we might consider surgically removing the cataract and treating the glaucoma with pressure-lowering medications or laser treatments. Cataract surgery alone on an eye with glaucoma will sometimes lower the pressure in the eye. For patients with more serious glaucoma and the need for cataract surgery, a combination cataract removal and glaucoma filtering procedure can be considered. For patients using multiple anti-glaucoma medications, a combination procedure such as this would be appropriate. Combination procedures, however, are not for everyone. The decision to perform a combination procedure depends on the number of anti-glaucoma medications used, how mature the cataract is, and the state of the glaucoma. The decision of whether or not combined cataract-glaucoma surgery should be performed, and the choice of glaucoma surgery, depends on various factors including the type of glaucoma and its severity. Your doctor will take all these important factors into consideration when advising what is best for your eye. A person may have a glaucoma procedure followed by cataract surgery, or have both surgeries done at the same time. The specific approach will depend on the medical needs of the person with glaucoma. For patients who have both glaucoma and cataracts, combining separate procedures on the same day is not only more convenient than having two separate surgeries, but it can provide improved vision and improved intraocular pressure control. In many circumstances, glaucoma medications can be reduced or eliminated afterwards. Cataract surgery in a patient with glaucoma may give rise to unique concerns. For example, in patients with exfoliation glaucoma, there is a higher risk of complications due to inherent weakness in the supportive structure of the natural lens (the zonules). Some newer types of intraocular lenses may not be suitable for patients with advanced glaucoma because they affect contrast sensitivity (the ability to distinguish between an object and its background) or may cause additional sensitivity to glare. Eye pressure spikes after cataract surgery may be more common in patients with underlying glaucoma and importantly, glaucoma patients are more likely to be susceptible to damage from a transient increase in eye pressure. To conclude, in patients with coexisting cataract and glaucoma, surgical treatment poses unique challenges. There are several treatment options and many variables factor into the decision to choose a particular procedure. A detailed discussion with your doctor is important in order to determine the best option for you. Glaucoma clinic at Advanced Eye Hospital and Institute in Navi Mumbai is equipped with one of the best glaucoma clinics in Mumbai. Glaucoma diagnostic facilities, check-up and the operation theatres are state-of-art and equipped with the best diagnostic and surgery machines. Personalized care, infection free modular operation theatres and beautiful ambiance complement the cutting-edge eye care offered at AEHI. Besides treating patients from Kharghar, Nerul, Vashi and Panvel, patients from all over western India travel to AEHI for world class glaucoma management.